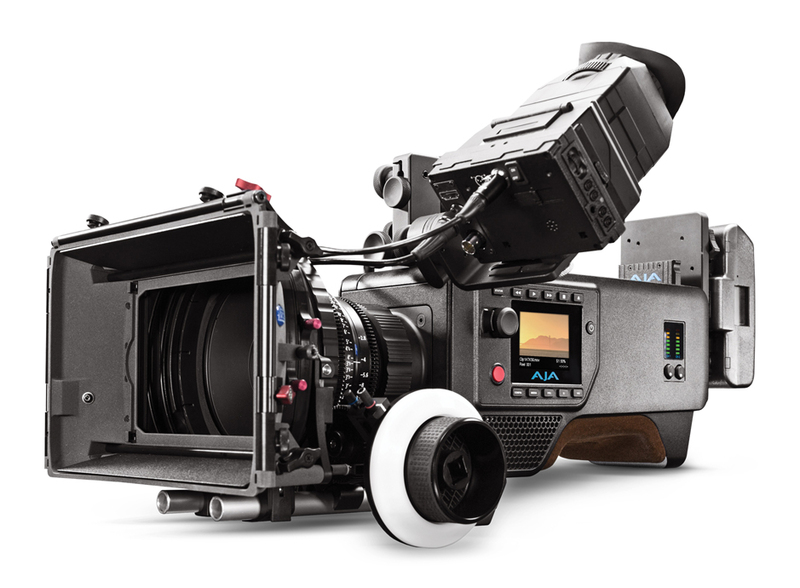 AJA Video Systems’ CION camera is now shipping worldwide. The cameras-to-go picture above is from a recent visit and an upcoming FDTimes article. CION was designed by people who worked as cameramen. It is ergonomic and extremely lightweight. CION shoots 4K/UltraHD and 2K/HD. It records in-camera to the Apple ProRes family of codecs, including 12-bit ProRes 444, on economical AJA Pak SSD media up to 4K/60p. CION also provides outputs for AJA Raw HFR at up to 4K/120p. AJA says that CION is the only 4K/UltraHD camera capable of capturing internally to 12-bit ProRes 444. CION has multiple, simultaneous on-set monitoring outputs. You can choose a combination of 2 x 4K/UltraHD and 3 x 2K/HD or 8 x 2K/HD outputs. A LAN connection and embedded webserver enables remote configuration and control, and you can set up and control or gang control multiple CION cameras via a standard web browser. The body is made from a lightweight, strong magnesium alloy and has a contoured suede leather shoulder pad. CION is easy and comfortable to setup and operate. Using AJA’s Pak Dock, CION SSD media can be downloaded queickly via Thunderbolt or USB3. Third-party camera accessory manufacturers including Alphatron, MTF, Portabrace, Wooden Camera, Vocas, Zacuto, ARRI and others have already built accessories: viewfinders, lens mounts and cases. Support for AJA Raw has been announced by Adobe and Colorfront. Third party lens mounts are available to let CION use almost any 35mm lens. Sensor: 4K APS-C sized CMOS sensor with electronic global shutter. Official spec is 12-stops of dynamic range, but having seen the camera, I would extend that to 13-14 stops. Exposure index: 250, 320, 500 and 800. Gamma: Disabled, Normal, Normal Expanded, Video and Expanded 1. Media: Record to AJA Pak SSD media in 256GB and 512GB sizes. Transfer via Thunderbolt or USB3 with optional AJA Pak Dock; Complete 10-bit and 12-bit workflow from HD to 4K. Lens Mount: Industry standard PL mount, removable, with 3rd party mounts available for CanonEF/FD, Nikon F/G-Mount, Leica M, ARRI Bayonet, Panavision and B4 ENG lenses. • Cover Glass: Optical Low Pass Filter reduces unwanted moiré effects while still retaining image detail. The infrared (IR) cut filter blocks unwanted light wavelengths. • Back Focus Adjustment: The mechanical calibration of the flange focal depth (distance between lens and sensor) allows fine adjustments. • Industrial design: Lightweight magnesium chassis, built-in confidence monitor, standard playback controls and connectors. Integrated “cheese plates” fitted to both the top and the bottom of the chassis provide easy mounting of accessories. All CION accessory connection points use open standards, including 15mm rods, 1/4-20 and 3/8-16 threaded holes, and M6 Hirth-tooth rosettes. Watch CION Technical Video, Images Reel, Features Video, and download Technical Notes here. CION is US MSRP $8,995. AJA Pak SSD media is US MSRP of $695 (256GB) and $1295 (512GB). 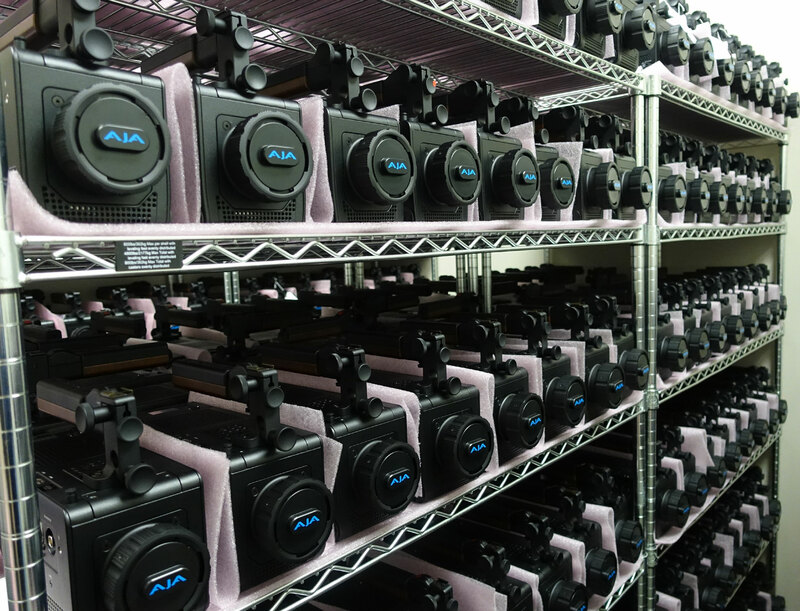 Many other AJA camera accessories. To order, see this list of AJA CION resellers.